A change in political competition changes the dictator’s feasible set of combinations of tax raised per year, and expected years in office. In this Leibniz we show how to model the effect of a change in competition on the duration curve, and how to decompose the effect on duration into income and substitution effects for the case of a linear duration curve. 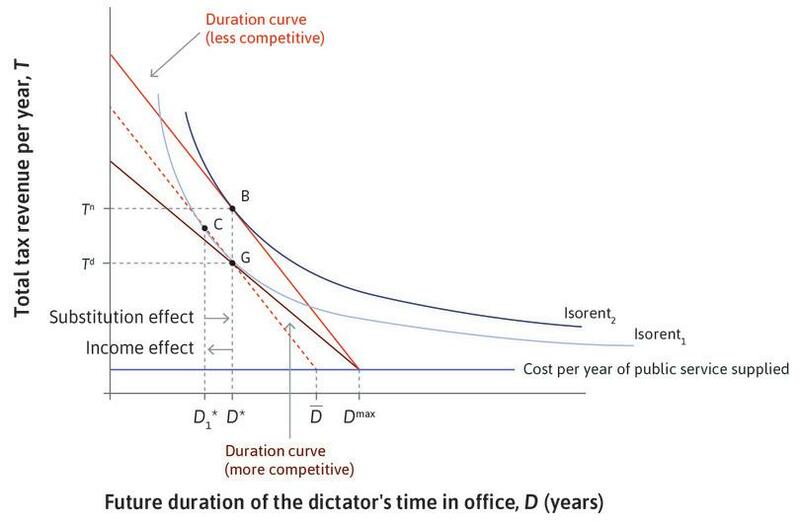 We showed in Leibniz 22.2.1 that the dictator’s duration curve is determined by the probability that he is dismissed from office for performance reasons, which depends on the taxes he sets, and the probability of dismissal for other reasons, . The equation of the duration curve is . Remember also that when is equal to , the cost of services supplied, , is zero, and . An increase in political competition implies that the dismissal probability increases, and hence the expected duration decreases at every level of , while remains at zero. Thus the duration curve pivots around the point , as shown in Figure 22.9 of the text, reproduced as Figure 1 below. Choice of taxes under less and more competitive conditions. Figure 1 Choice of taxes under less and more competitive conditions. 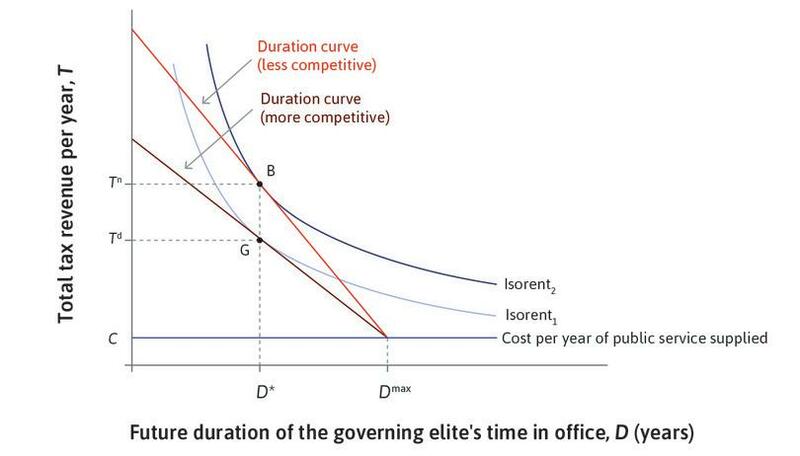 In this figure, the effect of an increase in competition is to move the outcome from B to G. It reduces the tax chosen by the political elite, while the duration in office remains the same as before. An increase in political competition can be represented in this model as a fall in the parameter , flattening the duration curve. Suppose that initially , and then an increase in competition reduces it to . You can see immediately from the solution above that the tax falls, but there is no effect on the duration . 1. What is the overall effect of the fall in on duration? It is zero: remains at . What parallel shift of the duration curve (that is, a change in the feasible set without any change in the MRT) would have the same effect on the dictator’s rent as the fall in ? Solving this equation gives us . 3. How would that change affect ? Note that this shift also lowers taxes. It shrinks his feasible set, leading him to lower both taxes and duration. It changes his trade-off between duration and taxation (the MRT), so that a rise in taxes has a bigger effect on duration. This leads him to decrease taxes further and thereby increase duration. Figure 2 shows the decomposition into the income and substitution effect. As in Figure 1, the overall effect of the increase in political competition is a movement from B to G, with no change in duration. The income effect is the effect of a parallel shift in the duration curve, giving the same change in rent as the overall effect. It is represented by the dotted duration curve, which has the same slope as the original one, but a lower maximum duration. This causes a movement from B to C, reducing duration to . The substitution effect causes a movement from C to G, increasing duration back to the original level and reducing taxes further; it is the effect of the change in slope (the dictator’s MRT) alone. The income and substitution effects of an increase in political competition. Figure 2 The income and substitution effects of an increase in political competition.